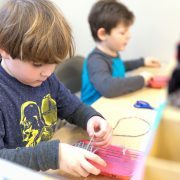 About: The benefits of incorporating core principles of your child’s classroom Montessori experience into their home life. The strongest benefit of this pairing is the development of the child’s executive functioning skills. Parents can take advantage of FCM’s elementary teachers knowledge of the prepared environment and the role of the adult in supporting their child’s independence beyond the classroom. When: Thursday, September 20 from 5:30-7 p.m.